With more and more machines the incorporation of electronics is becoming a norm. This has led to increased EMI or Electric and magnetic interference in production. EMI is generally caused by thyristor control, switching and VSDs. Although there are VSDs with built-in filters as a general rule most installations do not have internal filters. As a result, EMI can wreak havoc causing inexplicable problems in the normal operation of machines. 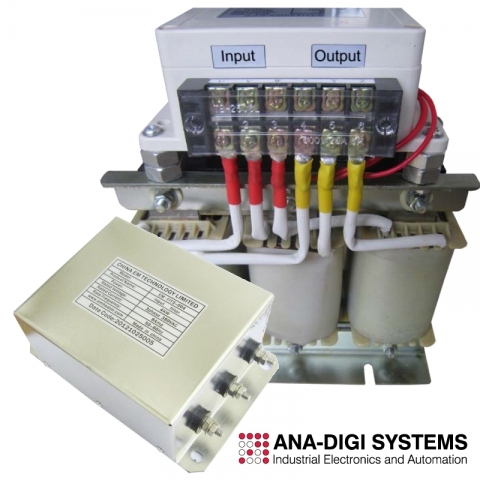 Ana-Digi Systems has a range of Normal EMI as well as Sine Wave Filters to address these issues. The ADS-EM Filter range is designed to convert the VSDs pulse modulation square wave signal to a smooth sine wave, thus significantly reducing or even eliminating EMI. Here are some of the benefits to this approach. Reduces high frequency loss and EMI. Extended cable length between motor and VSD greater than. Available for 220V ~ 1140V three phase VSD system. Suitable for motors and inverters from 0. 4kW – 1600kW. Suitable for output carrier frequency ranges from 1.5 ~ 16 KHz.